MARK: MY WORD malbert@mmsonline.com Mark Albert EDITORIAL DIRECTOR MMS JANUARY 2018 16 mmsonline.com Ninety Years Staying Modern Up to date. Constantly making improvements. Using the latest technology. Innovative. In 1928, that's what the founders of this magazine meant by being modern, as in Modern Machine Shop. They wanted their new magazine to promote the latest in machining technology, to endorse change and to encourage staying up to date. Of course, as editors and publishers, they recognized that they must do the same in their new publish- ing company. Ninety years later, that is still true. Our latest effort to renew this magazine is detailed in Peter Zelinski's column on page 18. Behind the new look and format of this print edition are innovations in how we gather, prepare and present information. This renewal is more than skin deep. Even at its founding, though, MMS was inno- vative. The original digest size of the magazine was a new devel- opment in 1928. MMS adopted it because it sig- naled that this new magazine had a distinctly shopf loor per- spective, as indicated by a size that would fit conveniently in the pocket of the white shop coats commonly worn in the era. Likewise, MMS was an early adopter of the reader service card, which subscribers could use to circle the number that matched the one at the bottom of an adver- tisement for a product of interest. This card vastly streamlined the start of the buying process. It disappeared when online product research became the norm. Surely, our launch of MMS Online in 1996 hastened its demise, as we built a robust digital presence. Computerization, however, had started transforming our publishing practices decades before that. We implemented computerized typesetting in the late 1970s before many larger publishing com- panies made the jump. The move to word process- ing came about five years later, when the personal computer became a viable business tool. Other digi- tal tools for handling artwork, layout, subscription fulfillment and so on followed in quick order. 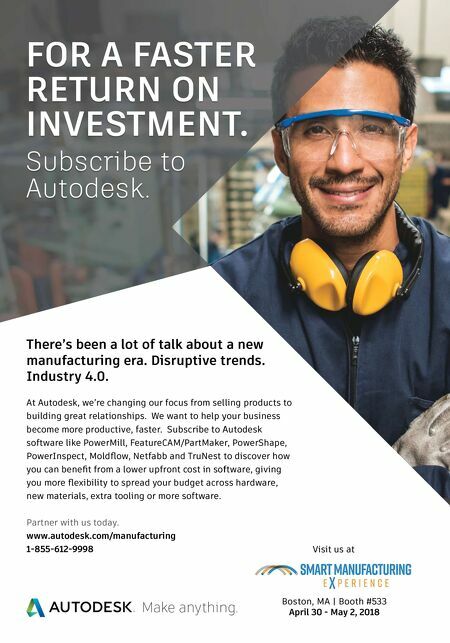 More important, we began covering the com- puterization of machine tools with a persistent focus on numerical control. By the 1960s, MMS was known as the "NC book," establishing the magazine as a leader in providing must-read editorial content. Making technical concepts understandable and compelling by telling the stories of successful shop users became a hallmark of our writing style. That is still true today. 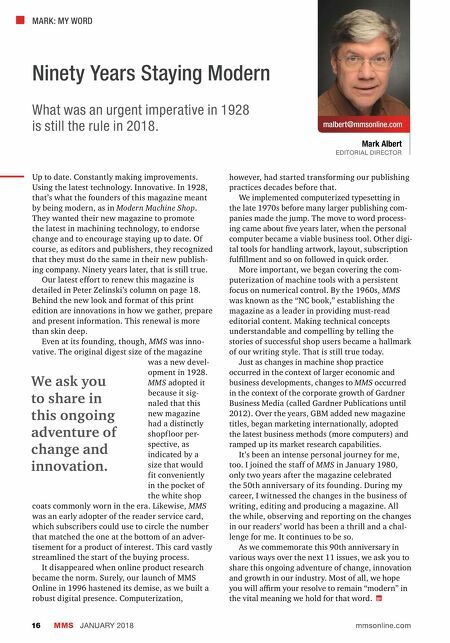 Just as changes in machine shop practice occurred in the context of larger economic and business developments, changes to MMS occurred in the context of the corporate growth of Gardner Business Media (called Gardner Publications until 2012). Over the years, GBM added new magazine titles, began marketing internationally, adopted the latest business methods (more computers) and ramped up its market research capabilities. It's been an intense personal journey for me, too. I joined the staff of MMS in January 1980, only two years after the magazine celebrated the 50th anniversary of its founding. During my career, I witnessed the changes in the business of writing, editing and producing a magazine. All the while, observing and reporting on the changes in our readers' world has been a thrill and a chal- lenge for me. It continues to be so. As we commemorate this 90th anniversary in various ways over the next 11 issues, we ask you to share this ongoing adventure of change, innovation and growth in our industry. Most of all, we hope you will affirm your resolve to remain "modern" in the vital meaning we hold for that word. What was an urgent imperative in 1928 is still the rule in 2018. We ask you to share in this ongoing adventure of change and innovation.